Yes, your HVAC system may actually be operating with the help of batteries. 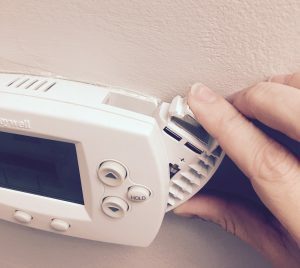 Most programmable thermostats are hard wired to your furnace, which powers the thermostat. These thermostats also use batteries to remember your system settings in case of a loss of power. Your thermostat may show a low battery symbol on the display screen and it’s better to change the batteries before they fail all together. If the display screen is blank, or your system will not come on, weak or empty batteries may be the culprit. Each thermostat model is different. On most, you can gently pull the cover of the thermostat until it pops off to reach the batteries beneath. Or, it may have a compartment on the side that slides open. Refer to your owners manual for instructions or call our office. We are happy to help you. One trick I use every year: check my thermostat batteries when I change the batteries in my smoke detector and CO detector – at Daylight Savings time change.